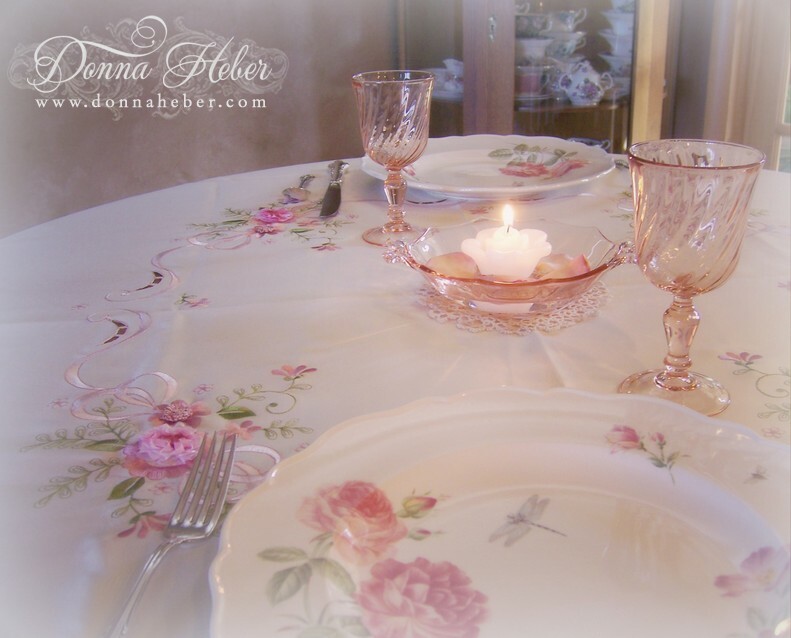 Today I'm sharing a quick tablescape I put together the other night. It was too warm to use the oven so a crisp green salad topped with grilled chicken strips was on the menu. 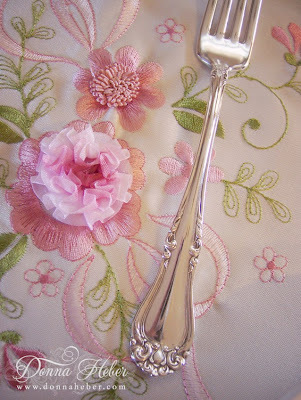 I used my Martha Stewart / Wedgwood rose plates with some vintage flatware. Arcoroc Rosaline pink stemware creates a little sparkle. A gorgeous shade of pink with raised swirled ridges. These glasses, made in France, mix nicely with other pieces. 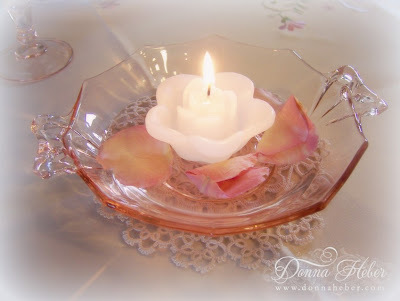 The pretty centerpiece is vintage depression glass from the 1930's. This bowl was made by Fostoria Glass Co. in the 'Fairfax' pattern. 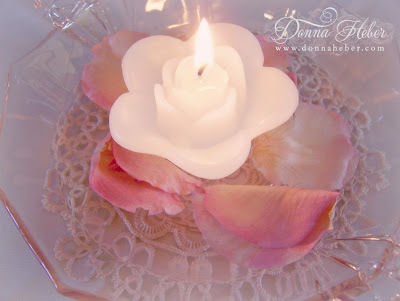 All I added was a floating candle with some pink rose petals from the garden. 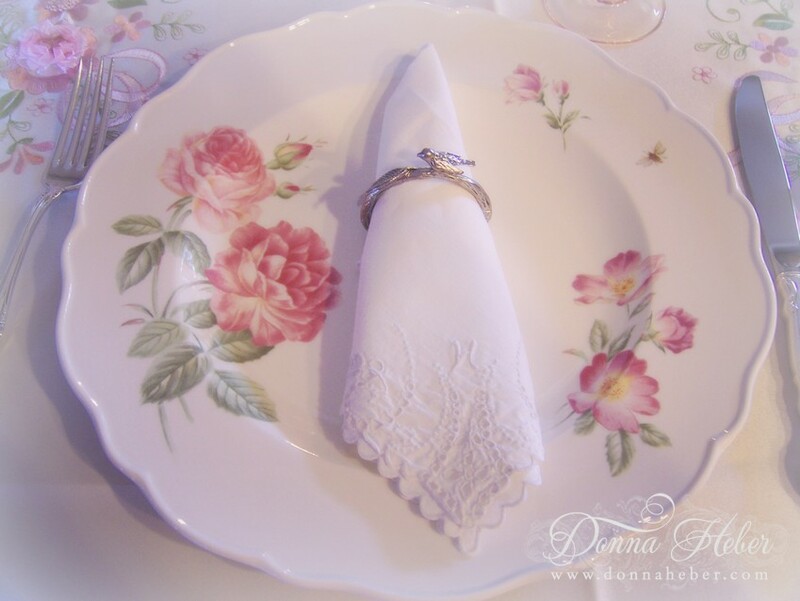 This beautiful vintage napkin with cutwork and monogrammed with the letter "H" was a treasured find. I purchased the set of five for $1.80! 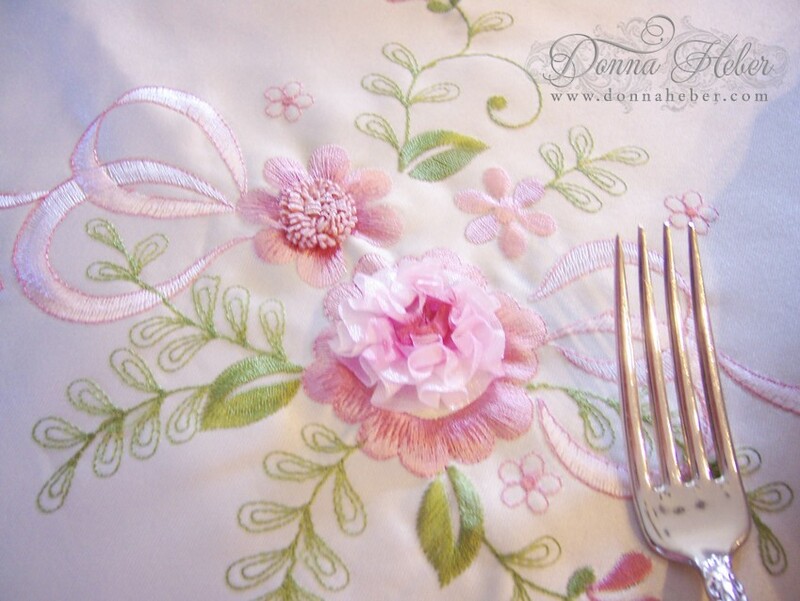 A vintage inspired tablecloth is one of my favorites with its pink flowers and soft green leaves. Thank you for stopping by tonight. My door is always open for you! I am pleased to be joining the following blog parties and hope you will visit our wonderful hostesses. Everything looks absolutely beautiful, Donna! I just love your tablescape....the dishes are so pretty and I just LOVE your tablecloth! Thanks for sharing and I hope you have a wonderful night! Donna, I love your Martha Stewart china! Your whole table scape is adorable. Oh Donna, your MS china is gorgeous, so sweet and elegant at the same time. I love your flatware and the pretty pink glass you paired with. Lovely! Enjoy your week. Lovely! So when do we all come to dinner??? Everything looks stunning Donna. The table cloth and dishes match perfectly. So pretty Donna! I love the tablecloth! That is so unique! I've never seen flowers with that much texture and depth on a tablecloth! Your Martha Stewart dishes look perfect on it and so does the beautiful pink depression glass. Lovely table! wow this looks very romantic and elegant Donna. Absolutely beautiful! I would love to enjoy a meal at your table! That is a beautiful tablecloth. Your table is so fresh and lovely! Your pink stemware caught my eye. It's beautiful! It looks so feminine and pretty! I love pretty roses and pink depression glass! I would feel right at home! 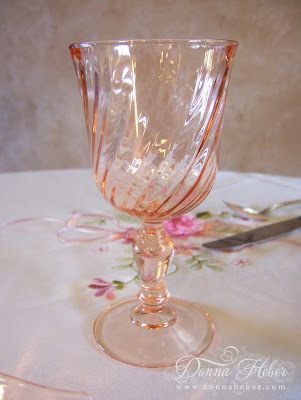 The pink depression-glass stemware is so beautiful, Donna--I love it all! Thank you so much for stopping by my blog today and leaving a sweet comment--I appreciate it! And I will enjoy the weekend--same to you! That is a lovely table scape. Love the roses. What a pretty table. Everything is so dainty and romantic. Pink is a favorite any time. 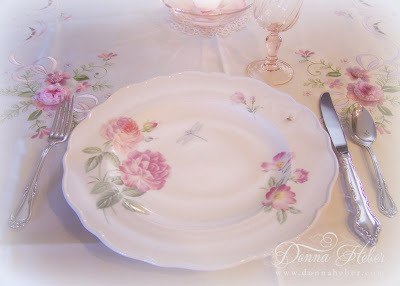 Pretty pink roses in your china and I love the scallop on the edge of the plate. 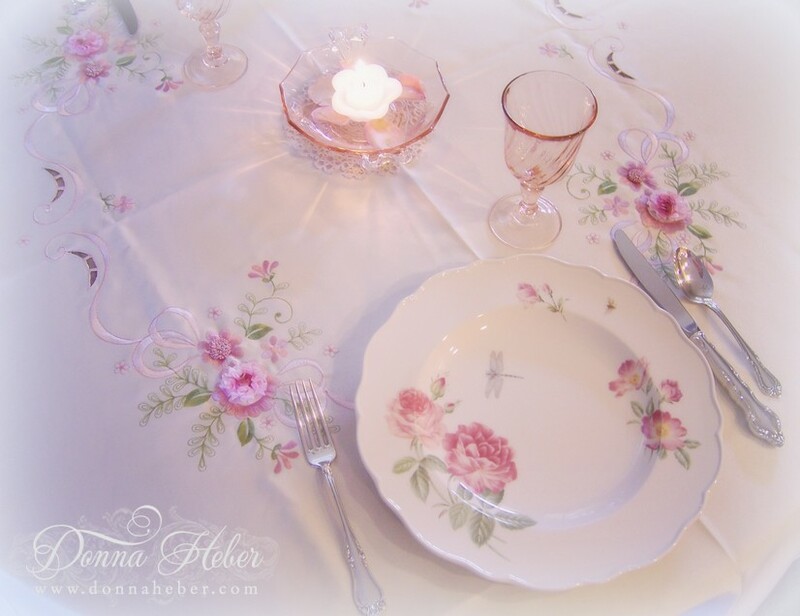 The tablecloth flowers are perfect with your pink glassware and china. 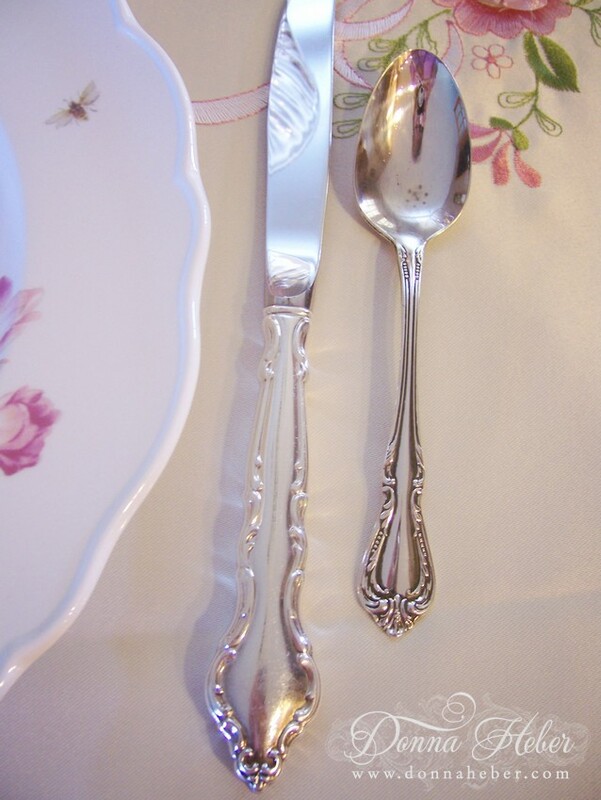 Even your sweet flatware has the scallops and flower motif. 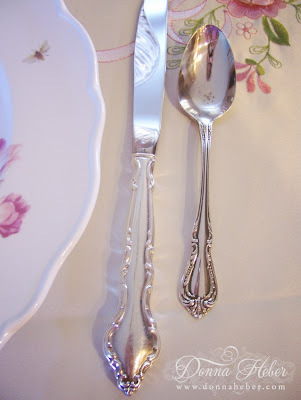 Please, pop over to view my find used in a vacation tablescape! I am sure your guests will enjoy! Your treasures are so pretty and romantic. I been telling myself to purchase distress tablewares, however can't find such beauties like what you have. Happy TTT... TS and a great week-end ahead. I LOVE this. Pink is one of my favorite colors for china. Now this is romantic. Lovely shots! What a lovely site for this beautiful Pink Saturday. They are all so beautiful. Thank you for sharing them. Visiting from Pink Saturday, you have a beautiful blog. Great table setting. I'd be delighted to join you at this table. Happy Pink Saturday! What a gorgeous table! I love your pink glasses from France, and the pretty tablecloth looks just beautiful with your dishes! What a pretty table setting, so cool and calm! 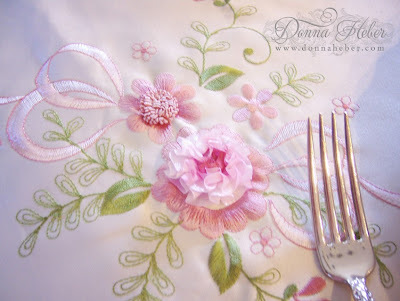 I love the embroidery on the tablecloth. Oh my...What a gorgeous table presentation. Those plates and table cloth are just breath of fresh air. So much romance.